Can you imagine how awesome a 12 string version of a Holdsworth Fatboy would sound. If I could do photoshop, I would render a 12 string, and a double neck 6 12 version. The headless DN model would be cool too. 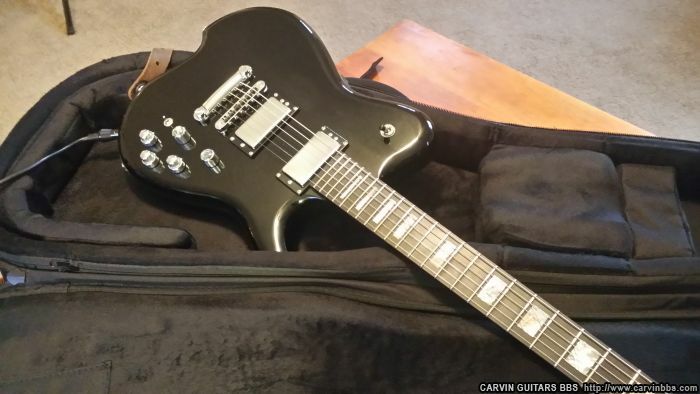 I dig electric 12's, and I dig my Fatboy, but I have a feeling that the extra tuners would throw the balance off and make a 12-string Fatboy neck-heavy. My Fatboy balances fine, but I had to relocate the upper strap button to the bass-side upper bout. It would probably work better with an H2 (H12?). 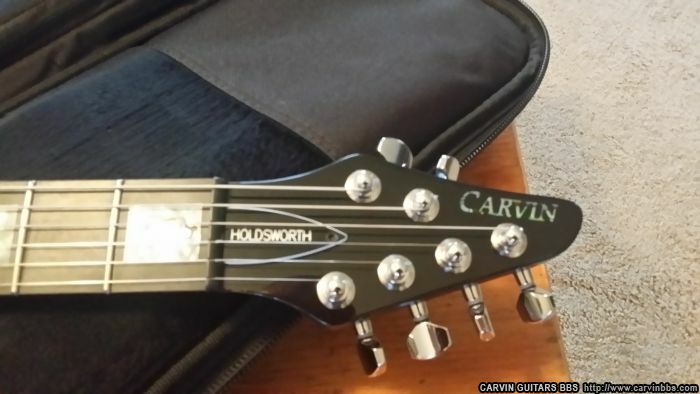 So, when the Holdsworth guitars first came out, I wasn't really interested. I'm not a fan of headless guitars, in general, and the later models didn't really do anything for me at the time, either. About a year and a half ago I got an SH275. 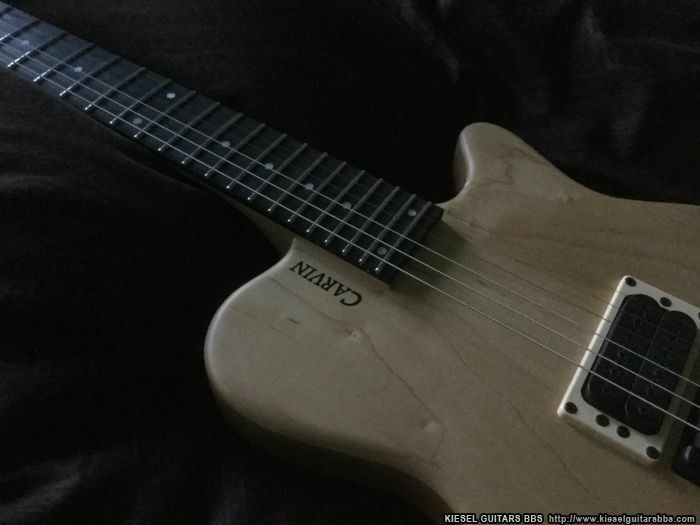 It was my first new Carvin and my second overall(I used to have an AE185 I got and later sold on eBay). I LOVE the variety of sounds I can get from my 275, and the build quality is amazing(was on the used 185, too). String tension: I use pretty heavy strings, specifically D'Addario Chromes Flatwound Jazz Light(12-52), so between that and spending several years playing almost entirely acoustic guitars(also with 12s or 13s), I've gotten used to stiff strings. That said I've also spent the past decade or so down-tuned a half step, and recently thought I might go back to standard tuning. Combined with the longer scale(25.5 on the HF2S vs 25 on the SH275), how much more tension might I expect on the strings? Would going to one notch lighter(11-50) get me back in the same ballpark? Woods: my current guitar is walnut neck/body with maple top, which looks good and sounds awesome. I have thought about just going with the same woods(although I will most likely go gloss instead of tung oil this time), but then I thought the birch looks pretty cool already. The stock wood is birch front and back(if I'm not mistaken), and it seems that changing body wood option replaces the back along with the 'body', or sides. Has anyone looked into getting a top wood option on both the top and back? I assume there's an upcharge, perhaps opt50, for that? Also, I know that on electric guitars, even semi-hollow ones, the wood choice doesn't have a huge impact on sound, but I'm curious about any feedback current/previous owners can give on how different woods sound/feel, especially on the HF2(S). I think there's more agreement on neck wood effecting(A-ffecting? I can never remember which is which... anyway) tone, and I like the way my walnut neck sounds now, so I'd probably go that way again. Another thing, I'm interested in what neck pickups people are using, and what they love or loathe about them. I'm 99% sure I'll have an M22SD in the neck position, since I've been using them longer than I've been playing Carvins. As for what I'm looking for in the neck position, I suppose the simple answer is 'not an M22SD'. Since the bridge will cover all the paint-peeling, high-gain, wall-o-Satan sounds I could ever want, I suppose I'm interested in something more smooth, warm, mellow... something along those lines? 1. This is a really slow group. The last post was by me, and was a year and a half ago!? 2. I haven't posted any pics of my Holdsworth!?!?!?!? How could I be so remiss?!? Oh, also, since I've had mine for a few months now, I'll answer some of my own questions in case a future reader wonders anything similar. brento73 wrote: So, when the Holdsworth guitars first came out, I wasn't really interested. I'm not a fan of headless guitars, in general, and the later models didn't really do anything for me at the time, either. About a year and a half ago I got an SH275. It was my first new Carvin and my second overall(I used to have an AE185 I got and later sold on eBay). I LOVE the variety of sounds I can get from my 275, and the build quality is amazing(was on the used 185, too). Ok, so I've decided I'm a mutant here, but... I ended up going with the same strings/tuning on the longer scale(12-52, down a half-step) and then, recently, went down to D-standard and 13-56. It plays great, feels great, and I have nothing but good times playing it. Your mileage may vary. brento73 wrote: Woods: my current guitar is walnut neck/body with maple top, which looks good and sounds awesome. I have thought about just going with the same woods(although I will most likely go gloss instead of tung oil this time), but then I thought the birch looks pretty cool already. The stock wood is birch front and back(if I'm not mistaken), and it seems that changing body wood option replaces the back along with the 'body', or sides. Has anyone looked into getting a top wood option on both the top and back? I assume there's an upcharge, perhaps opt50, for that? Also, I know that on electric guitars, even semi-hollow ones, the wood choice doesn't have a huge impact on sound, but I'm curious about any feedback current/previous owners can give on how different woods sound/feel, especially on the HF2(S). I think there's more agreement on neck wood effecting(A-ffecting? I can never remember which is which... anyway) tone, and I like the way my walnut neck sounds now, so I'd probably go that way again. I ended up going a totally different way on this, color-wise(see previous post). I'm really happy with Black Magic Metallic, and have no regrets. The woods are stock, so maple neck, alder body, birch top. Whether the back is, indeed, birch, I'll likely never know since I went with the solid color. I also can't say whether the wood plays a role in the tone, since I don't have another, different, HF2 I can A/B it with, but it sounds great. brento73 wrote: since I've been using them longer than I've been playing Carvins. As for what I'm looking for in the neck position, I suppose the simple answer is 'not an M22SD'. Since the bridge will cover all the paint-peeling, high-gain, wall-o-Satan sounds I could ever want, I suppose I'm interested in something more smooth, warm, mellow... something along those lines? As can also be seen above, I went with covered pick ups. In large part, this was because I thought it would look %&$#-ing RAD, and it does. I'm very happy with the sound, though, which is good news! It's not quite the same as my previous guitars with the M22SD, but it gets the job done. Here's my HH1, ordered right after the announcement in Feb. 2012 iirc. This is the one I wouldn't be without and would probably grab first if the house was on fire. After playing "normal" guitars for decades it has turned me into a certified headless/ double ball string nut. I love those giant birdeyes lurking around on your top. I have a bunch of those in a solid KOA axe believe it or not ! BigViolin wrote: After playing "normal" guitars for decades it has turned me into a certified headless/ double ball string nut. Nice looking HH you have too. Dr., your koa axe looks amazing. Thanks! Expecting a very plain top I was pleasantly surprised to get a one with a lot of character and birdeyes. Yeah Colossal, string changes are a joy, it's just such a superior system all the way around for me. Wonder if anyone will ever make custom lengths for multiscale headless. Likely not as it's such a small market but would make me want to try a multiscale Vader even more. BigViolin wrote: Yeah Colossal, string changes are a joy, it's just such a superior system all the way around for me. Wonder if anyone will ever make custom lengths for multi scale headless. Definitely superior in my opinion as well and that is one of the things that is kind of a deal breaker for me with the Hipshot headpiece on the Vaders: no double ball. I bet La Bella would make a custom set for multiscale guitars. There would just have to be enough demand to cover the run. 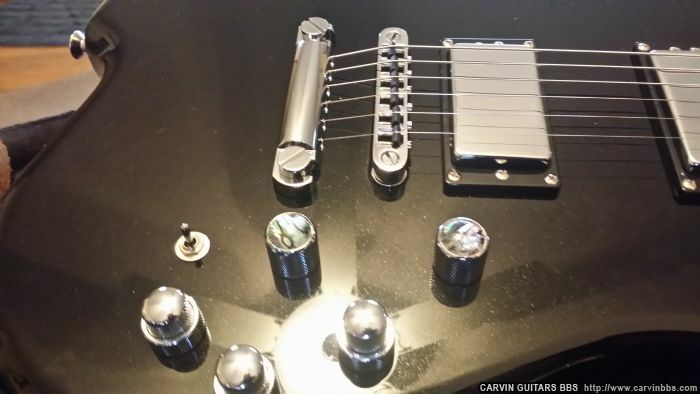 According to the hipshot site if you remove the grub screws the channels will accept double ball strings so if you wanted the 25.5" vader 6 it should be good to go. Haven't seen it in practice though and it looks pretty short to allow room for the extra string wraps before the zero fret. I just checked out your claro topped HH1...wow...what a top!! If anyone checks this thread, could you please tell me the stud spacing on the tune-o-matic bridge? Hey everyone! Anyone know how much their H2 weighs? Hey folks! Not sure if this is still active, but I’m looking for some reassurance/advice ordering my first Kiesel - which will also be my first custom and my first headless - so lots of nerves all around. the switch to headless - why, and how did you like it? Any thoughts on the combination of walnut top, chambered mahogany body, maple neck and ebony fretboard? Never had to choose the woods on a guitar before and it’s a bit overwhelming. I got my first Kiesel, the HH2X 100% based upon watching videos of Allan playing it and describing why he loved the guitar. So, I took a leap of faith. I'm glad I did. I love the headless to the point where 4 of the 5 electric guitars that I own are headless. It felt disorienting for about 5 minutes not having the headstock. That was it. I never looked back. My 2nd HH2X has exactly those woods and chambering. It's a great guitar. thanks for you response. I took the plunge this morning and ordered my HH2! I went with an alder body instead of mahogany to stay a little closer to Allan's specs - but still went with the walnut top. I love the way yours looks, I hope mine has similar streaks.